When airship engineer Melody McKay’s dirigible explodes and plunges her into the yard of a gothic manor, she suspects foul play. With her ankle injured—an indignity far too feminine for her taste—she resolves to crack the mystery while in the care of Victor Arrington, the stuffy-yet-disarming Earl of Blackwell. Here’s what I thought: I’m not well-versed in Steampunk, but I chose this novella because I love dragons. Alas, there aren’t any real dragons in this story. Nevertheless, I found this short read interesting and entertaining. DRAGONS AND DIRIGIBLES is a blend of genres. Set in 1860 along the Devon coastline of England, the story has interesting, mechanical devices that is expected in a steampunk story. There’s also mystery and romance, with hints of paranormal and Arthurian fantasy. Victor Arrington comes across a bit starched at first, but I believe this is due to the Victorian influence. As the story progressed, I did find him to be a suitable compliment to the heroine, Melody McKay, a non-traditional Victorian woman. Independent, feisty, and more than competent in a male dominated society, she is truly the life of the story. Her dirigible crashing on Victor’s estate sets off a chain of events that rocks the foundation of the stone manor and the lives of everyone connected to it. Melody’s irreverence and non-conformity breathes fresh air on the stagnancy of a household in mourning for too long. The twist that really hooked me is that Melody isn’t simply a flying machine inventor, she a member of “The Order,” as in The Order of the Round Table. Yep, that’s right. This story has a tie-in to King Arthur and the Knights of the Round Table. Melody, and the rest of The Order are descendants of the original knights and they fight supernatural, and other, threats to crown and country. Although Melody isn’t a knight on the “front lines” of the ongoing battle of good and evil, her airship crash lands her smack-dab in the middle of a deadly smuggling operation that Victor is trying to stop. They must work together to solve the mystery before someone ends up dead. Forced proximity is a common trope in romances, and although the romantic element isn’t the central focus of this story, it works organically as a subplot. I found the writing smooth and the author’s voice non-intrusive, so this was a pleasantly quick read. DRAGONS AND DIRIGIBLES is the 7th installment of the Gaslight Chronicles. Despite not having read the previous stories, I was able to follow the world-building and integral relationships of the secondary characters without confusion. 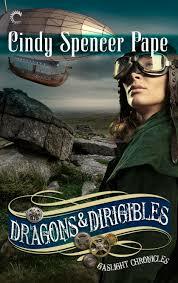 If you are a fan of romantic mysteries, I think you’ll enjoy DRAGONS AND DIRIGIBLES even if you’ve never experienced the world of Steampunk. This book was provided by Net Galley for an honest review. No other compensation was offered or received. A very nice review, Cindy. I have never read a steampunk story either, but it sounds intriguing. What a great review! I would have looked for dragons too! But Cindy’s books are so tantalizing!